No.6 delves into a future reality into the aftermath of a huge war that split society into six separate cities. "NO.6" is just one of those 'ideal' cities that seem all too perfect. Of course, nothing is ever perfect in this world and dark truths are uncovered in this tail of a corrupt government and its inhabitants. No.6 is not like your average sci-fi. It in fact can't really be considered a true sci-fi anime at all. Considering the anime is set in an alternate future where mankind has been split into several 'ideal' cities and that the technology shown in the anime is not too futuristic, it is safe to say that this is more of a action anime than a sci-fi. 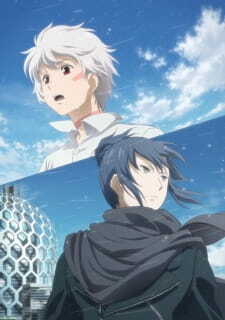 Moving on, the story is about Shion, a boy living his life to the fullest until Nezumi stumbles into his house one night. This starts all the events that leads to Shion and Nezumi to discover the true purpose and dark secret of "NO.6". They run away to "Lost Town", a rundown town in the outskirts of the city. Four years later, we see Shion and Nezumi develop an 'interesting' relationship with each other as they decide their fate on which path to follow. The story here is rather linear and dull; most of the episodes were action-less apart from the last few episodes. The art was not one of No.6’s stronger points. While it isn’t terrible, it isn’t amazing. The characters are sometimes really awkwardly drawn/animated, such as Shion’s scar or his blushing. But the background and scenery are amazing, and the opening scene was done beautifully; especially the last thirty seconds. Apart from that, you will have to deal with bland backgrounds. I did not like the theme songs at all especially the opening song. It was high pitched and annoying. Apart from the theme songs, I guess that voice acting was rather decent; but not excellent. It took some time to get used to Shion and Nezumi's voices. Overall, I would say that it was average and plain. I could not find a favourite character in this anime at all. I just felt that the characters in this anime were too generic or did not have enough charisma. Shion looks terrible with white-hair and Nezumi always looks stupid. I might be exaggerating here, but I felt no attachment to anyone in this anime. They were pretty much quickly forgotten. I must say that the interaction between Shion and Nezumi was rather random or disturbing at times. Overall, I did not especially like the presentation of this anime. The story was rather linear and dull with some action moments. Some details were left out such as why were there killer bees!? I may have missed something or did not pay attention enough to the dialogue. The characters were generic and unmemorable. I found both Shion and Nezumi boring and unpleasant. The sound track was disappointing and I felt that the anime lacked any quality. This is probably only a one-time only anime to watch. If you are interested in some slight action and sci-fi then give this a go. Some lack in detail on characters and backgrounds. Disliked the theme songs. Voice acting was plain. Somehow I found all the characters boring and unmemorable. I definitely will not watch this anime again. It was fine for the first few episodes then it went downhill fast. The ending picked up slightly but overall it was a average. I just didn't like it. Perhaps I'm being too harsh here but I really couldn't find something that was of high quality in the anime.